In response, Syria said it had recalled its ambassador to Washington for consultations. Ambassador Imad Moustapha left Washington on Monday, an embassy spokeswoman told the Associated Press. In Syria last month, Mr Ford and colleagues were pelted with eggs and tomatoes when visiting an opposition figure. 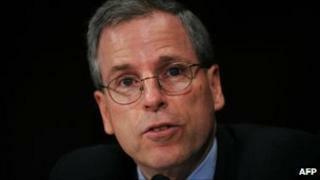 "We hope that the Syrian regime will end its incitement campaign against Ambassador Ford," he said. The state department insisted that Ambassador Ford was not being recalled or withdrawn. That would be a serious diplomatic move. Instead, Washington says he is expected to return to Damascus after consultations at home. But that could change. The US ambassador to Libya was brought home in January because of concerns for his safety. He only returned this month, after the fall of Tripoli. The state department has called for an end of the incitement against Mr Ford in the Syrian state media. A spokeswoman would not comment on whether this was a precondition for his return or how it would be decided it was safe for him to return. If Mr Ford's departure was not openly meant as a political statement, it was certainly interpreted as such. The Syrians promptly called their own ambassador home for consultations. He has warned of the risk of sectarian conflict developing in Syria if the authorities intensify their suppression of protests. There continue to be daily reports of activists and protesters dying. The US has passed several rounds of sanctions against President Assad's government, as well as pushing for a UN resolution. However, US newspapers reported on Sunday that the Syrian government had been using software developed by a California-based company to censor the internet and conduct surveillance. US officials said they were looking into the reports. The company, Blue Coat Systems, told the Washington Post that it had not sold software to Syria's government, but left open the possibility that authorities there could have obtained it through a third party.